With Hallowe’en approaching here’s a thoroughly captivating story of monsters and misbehaviour by moonlight. 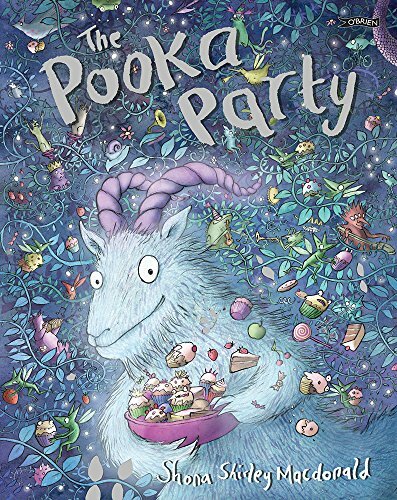 In Irish folklore a pooka is a shapeshifter – as the narrator explains that means it can take the shape of a goat, a cat, a dog, an eagle, a hare, a snail, a horse or even a person. The text snakes across the page, curling around a trail of changing creatures; background and figures are all represented in smoky eau de Nil, and the reader is plunged immediately into a magical world, perfectly poised for the adventure that follows. The Pooka lives a fairly normal life it appears, making soup, singing, painting and gardening, until suddenly it realises it’s lonely. Turning itself into a snail it ponders the problem, and decides to have a party – that will end its loneliness. Invitations are sent out (Deer FelloW Beeings), decorations put up and cakes (lots) baked. As midnight approaches, it seems that no-one is coming, but just as the Pooka, back in snail form, curls up to go to sleep the guests arrive. Now the calm palette changes to purples and blues as things get very lively indeed, with a cake fight breaking out between the mischievous goblins. The Moon has to intervene to restore order, leaning down from the sky to pluck up the participants from their cloud battleground. This is one of a number of beautifully composed and carefully coloured scenes each of which deepen the reader’s sense of being in a fairy other-world, beautiful and strange but beguiling. There are echoes of Rackham in the illustrations and they will tempt readers to lose themselves in the Pooka’s magical world.